The kit walks you through just about every scenario possible to help both you and the dog. It's exactly the tool kit for puppy mill and hoarding cases that Frankie's person was looking for. Frankie was one of more than 230 dogs confiscated from a hoarding situation. Best Friends took in 21 of the most difficult cases. Cordelia Mendoza and her husband Bob, who adopted Frankie, were sometimes at a loss in the beginning, helping get Frankie to the next level, although adoptions manager Kristi Littrell coached them and helped them along the way. "When we first got him, he was petrified, because he was so afraid," Mendoza says. "He would panic, and there was nothing we could do for him. He flinched whenever we touched him, and we had to wear oven mitts because he would try to bite us." In the beginning, "I called Kristi. It was sad to see him so frightened and not looking like he was making headway," she says. Littrell continued coaching from the sidelines as Frankie slowly acclimated. What the Mendozas gave Frankie was time and patience, which the action kit emphasizes. After about a month, something spectacular happened. Frankie reached out to them. "He decided to trust us, and he slowly started letting me touch him," Mendoza says. "He licked me and let me know he cared. It was the saddest thing the first time he did it, but it was happy at the same time. The one thing we've never done is talk harshly to him. We used common sense and talked gently and lovingly to him. We just tried to reassure Frankie that he was safe. I had to sit with him on the floor and hand feed him. He was just scared of everything." The action kit, she says, would have not only provided them with instructions, but also would have complimented the reassurances they were getting from Littrell that they were doing the right thing. "We took him everywhere with us that we could. He also went to work with me, to my store. I think that helped. He hid behind the counter, but he was with us nonetheless," she says. Slowly, Frankie learned to trust. And that's precisely what the "Rehabilitating a Dog Rescued from a Puppy Mill or Hoarding Situation Using Positive Techniques" action kit addresses. "In the beginning, your dog may not trust any human being," it says. "But by using positive, gentle and kind training techniques, you can become the first person your dog learns to trust." 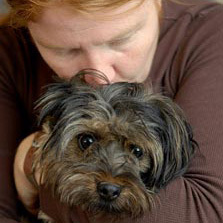 Sherry Woodard, an animal behaviorist and consultant for Best Friends, worked with a similar dog named Noble, who was rescued from substandard conditions at a puppy mill and displayed classic fear issues. Woodard helped Noble (who was later adopted) past those fears using the same tools that are offered in the action kit. "I have found that positive dog training built on a relationship is the most kind, effective method of training," says Woodard. "When you have a relationship with the dog, you have trust, and the dog wants to spend time with and work with you." And for volunteers who want to help dogs at the grassroots level by peacefully protesting at puppy stores. The kit, titled "Peaceful Pet Store Protest: Demonstrate Against the Sale of Pets," offers step-by-step instructions. 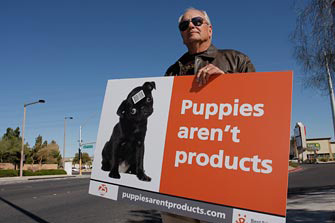 "Holding a peaceful pet-store demonstration can be an extremely effective way to voice your opinion about pet stores and the breeders who supply them with puppies," the kit says. "Even more important, it gives potential customers a reason to stop, think, and learn the facts so that they can make a more informed decision before they walk in and buy a puppy." The kit includes information for one-page handouts, signs, petitions, and even the best ways to interact with people. And while it emphasizes that organizing a peaceful demonstration is a lot of work, it means that you, the people at the grassroots level of protests, will be making a difference in animals" lives. As for Frankie, Mendoza says, "He's still very afraid of certain situations. But he has a fairly normal dog's life and all the comforts he needs, walks at the beach and to the park, and he's with us constantly." Most of all, she says, "Frankie's happy." 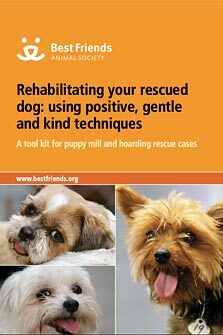 Check out the other helpful materials on the puppy mills resource page.